Some quick facts about Pertussis also called Whooping Cough. Pertussis related deaths declined before pertussis vaccine was introduced. Note the articles below by 4 doctors and a scientist ! The above article in a printable PDF file with some added graphs, original footnotes and no extra side bars. False Alarm Over Pertussis "Outbreak"
June, 2010, pertussis spiked in California. June-Aug is the season for pertussis epidemics, which is also the season for pesticide spray programs, quarantines, and peak outdoor air pollution. The essential reason why the downward trend of pertussis incidence reversed about 1980. Increased vaccination rates due to universal school mandates. Journal of the History of Medicine and Allied Sciences 57.3 (2002) 249-284 During the last half of the twentieth century, pertussis vaccine has been at the center of controversies over the evaluation and marketing of vaccines for children. This controversy has transcended the simple confines of scientific research to redefine relationships among industry, government, law, and consumer advocacy. The dangerous side effects of whole-cell pertussis vaccine have been known for at least the last five decades, and for the last four a safer alternative has been available. Q. If public health is not at stake, then why do we have vaccine mandates? A. Money provides the overwhelming impetus for vaccine mandates. State governments receive money from federal funds for vaccine purchase and vaccination tracking. Secretary Joseph Califano, Department of Health and Human Services (HHS), wrote to the governor of every state in April, 1977, urging them to enact and enforce compulsory vaccination laws. The CDC, a branch of HHS, advocated the establishment and universal enforcement for immunization before school entry. All states were asked to review their immunization laws and enforcement policies and were reminded of the annual receipt of federal funds to purchase vaccines and support vaccine infrastructure. The effect of this “green encouragement” was that by 1980, all 50 states had laws that linked vaccination with school entrance. State officials want to be in a position to say that vaccinations are “voluntary” in order to avoid the enormous legal liabilities that otherwise arise if a child is harmed or killed by mandatory vaccinations. Exemptions provide both legal and scientific benefits to the state. The perception that vaccination is mandated benefits financial programs that reward based on high rates of vaccination. 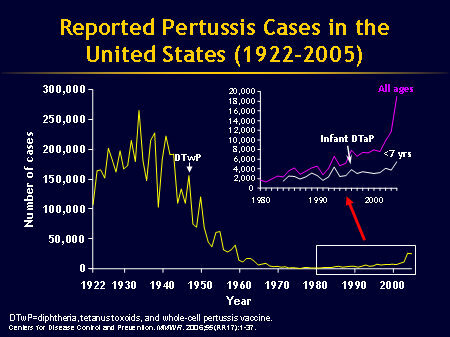 Image from medscape.com showing the reversal of pertussis incidence about the same time as univeral mandates for DTP vaccine as well as other vaccines. Decline in death rates. Most of the death rate decline occurred before pertussis vaccination was introduced. CDC graph showing decline in Pertussis cases in the USA prior to the introduction of DTwP.